Welcome to this series of articles about "How To Build A Photo Booth" . These articles were written by the staff at Photo Booth Experts. The purpose of these articles is not to sell our products. Rather, they were written to give ideas, details and other useful information to those looking to build their own photo booths. PLEASE NOTE! What you about to read is only our opinion (based on our own experience) of what we feel is the best approach when building and designing a photo booth for party rentals. Remember that the choice of structure design, components used and software is ultimately up to you. Depending on your Photo Booth Enclosure design you may want to enhance its look with some lighting. 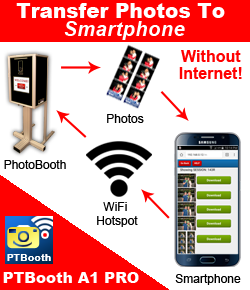 This will help to create a comfortable atmosphere for your photo booth customers and create a perfect scene that will help your camera to take quality photos. The lighting can play an important part in the picture quality as well. Every camera works much better if the subjects being photographed are well-lit. What to look for when choosing Photo Booth Lighting. The lighting must be comfortable and pleasant to look at. Overbearing lights can be very uncomfortable for the customers using your photo booth. When it comes to reliable lighting we recommend LED lighting which is the ideal combination lighting that is compact and reliable. Lighting position. Position your lights in a way that will enable your customers to see without problems while at the same time providing sufficient amount of light. As far as lighting color goes we recommend that you do some research on the internet to find out what color is the best to use in photography. Note: It is important to remember that the photo booth lighting will not replace flash in any way! We hope this article will help you to make better decisions when it comes to buying and using lighting for your Photo Booth.